7.22 points at 32 votes (rank 290). 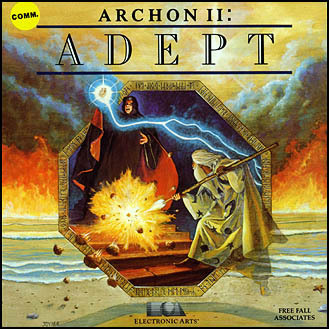 Archon 2 or also Adept is the successor of the successful Electronic Arts classic Archon. As already seen in Archon, an apocalyptic fight takes place in a fantasy surrounding, now not between "light" and "dark" but between "order" and "chaos". It all happens in a game area which is divided into 4 elemental layers. In the center is the earth layer, it is surrounded by the water layer and this is surrounded by the air layer. The outer layer is made of fire. Opposite to its forerunner the players start in Adept only with one magician ("Adept") per layer. All the other creatures have to be conjured in the course of the game. Evocations and other spells cost energy, which is renewed by occupying energy points on the game area with your own creatures. The more points you occupy, the more energy you get. Every side possesses 4 own elemental beings, which have a special force when they are on their corresponding layer. Moreover 4 different demons can be conjured from both sides, which can fight independently from the chosen element. Many of these creatures can use a shooting attack, but they have also lots of special attacks. When two figures meet on a field, here also the screen is zoomed and a fight for life and death starts. The winner claims the hard-fought field. Dependent on the layer you are fighting on, the battlefield has different obstacles such as slowing-down lakes, shoot destracting swirls, flame walls or simply walls ready. The only exception are the two void fields, here no terrain is used. you completely destroy the opponent. 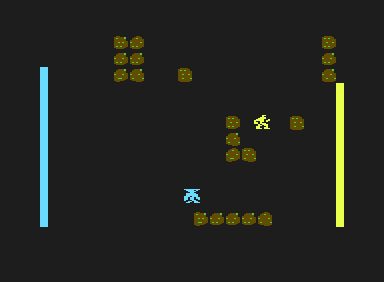 you have occupied the 4 wandering and 2 static energy points with your own figures at any point of the game. you destroy the opposing fortress with the help of the apocalypse spell. the energy of the opponent runs out. 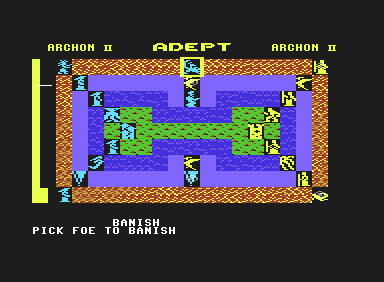 The quality of the graphics is the same as in Archon, extremely meagre and rough. The sound is limited to the moving noises of the fighting figures and their attacks and a short jingle at the end of the game. It is remarkable that the singing attack of the sirens corresponds to the first few bars of the title melody. 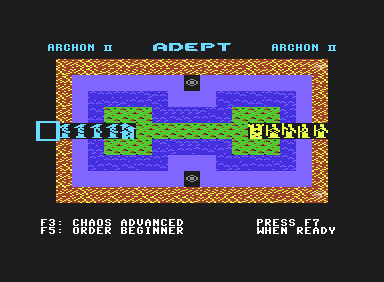 Unlike in Archon it is possible to choose different difficulty levels for both sides (run-stop button when choosing the side). If you want to play here with a handicap, you should anticipate a strongly reduced speed of your figures and considerably less energy for the spells. This allows equal opportunities with different abilities. 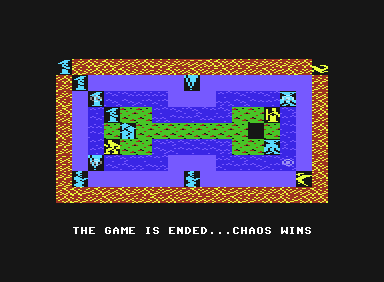 The game is -totally opposite to its forerunner- even on a normal level far from easy. If you expect a morning stroll a la Archon 1, you will get a nasty surprise. As soon as the oscillating frame is on your side it is your turn. Use the joystick to move the frame to the desired character. Press the fire button to "pick it up". Now you need to move with this character (if no move is possible with a character, then it cannot be "picked up"). After moving the character to the place of destination, press fire again to put it down. A spell is cast on the stragegy screen instead of a regular move. Just move the frame to the adept which is supposed to cast the spell and press fire. Without moving the character press the button again and the new message "select your spell" appears. Now move the joystick forwards or backwards to view the available spells. When you have found the desired spell, press fire to apply it. If further actions are needed from you, then continuative messages will appear and inform you properly. All things happening in the arena are direct and simultaneous; here there are no moves. You guide you character directly through the joystick. 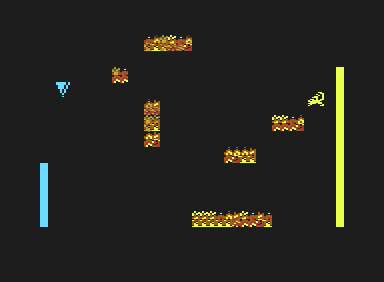 Pressing fire releases an attack into the direction the joystick points at. An attack can be done into all 8 directions. IMPORTANT: Your character cannot be moved while the fire button is pressed (except Juggernaut and Wraith9. During the fight your character cannot carry out the attacks as quickly as you could press your button. It takes a moment until a twister or a flood wave is created. If you press the fire button before your character is ready for the attack, this will only provoke a motionlessness of the character. The exact point of time, when your character is ready can carry our another attack, is marked by the computer through a bell-like sound. A high one for Order and a low one for Chaos. First every side has only 4 Adepts, which either can move (preferably onto energy points) or do magic. The Adepts are very quick, have lots of life energy and have steerable shots (keep pressing the fire button) with which can be shot even around corners. They are the strongest characters in the game and normally cannot be beaten by one opposing creature alone. Giant: A rock-throwing giant, not very quick. For its price a good allrounder. Octopuses: Giant octopus with water attack which causes with increasing distance, less up to no harm. Although it has lots of energy it is very handicapped by the limited reach of its attack. Thunderbird Lightning-shooting bird. Agile and very quick shot. It's the best elemental being. Perfectly appropriate for shooting opposing Adepts on void-fields. Salamander Corresponds to the Thunderbird, but has less energy. For the price a rather bad choice. Behemoth Very quick, lots of energy, but has only one weapon for close combat, which however does lots of harm. Good to chase the Adept from the computer enemy on the earth level. Siren The longer you keep pressing the fire button, the longer does the chant subtract energy from the opponent, no matter where it stands. However, for this it has to stand still and poses an easy aim. All the same it is sometimes very useful to completely destroy stricken figures. Ifrit Corresponds exactly the opposing Thunderbird. Good choice. Firebird Is able to haul flame aura attacks like the phoenix from Archon, which immunizes it against damage and reduces the energy of the enemy if it gets touched. Sounds good, but plays horribly. Mere waste of energy! Juggernaut Is put into the ramkick-mode by pressing fire, then it is imune against hostile attacks and can roll over the enemies. Unfortunately it is not steerable during this state and not usable. The computer player seems to love this figure though. Wraith Has an aura attack in stock, like Banshee from Archon, but adds the robbed energy from the opponents to its own. When it has sucked several enemies, it is a really horrible foe. A feared opponent of Siren and Juggernaut. Medusa Very weak, but has a petrification shooting attack, which first slows down the enemy and the switches it off, independently from the life energy. Can do wonders against Behemoths, Octopuses, Wraiths and opposing Adepts. Chimera Has lots of life energy and 3 alternating attacks in stock: - a normal shot, as e.g. from the Ifrit or the Thunderbird - a shot which corresponds the one from the Octopus - and a close combat weapon corresponding to the one of Behemoth. As it is difficult to coordinate the 3 different types of attack, the creature fails all along the line, especially as it is the most expensive of all. Revelry with touching in scene: the Giant tries in despair to escape its fate! Cease Conjuring Ends conjuring, you can move a figure instead. Summon The most important spell. Evokes any elemental being or a demon. Imprison Paralyses a hostile being, but no Adepts. Costs additional energy every round. Release Releases a hostile being from Imprison. Weaken Halfs the energy of a being, but not of Adepts. Heal Heals Adepts and creatures. Banish Destroys any evoked being. Very expensive. Apocalypse Through this the game goes into a sudden death mode. A final duel starts between the citadels of the players. Corresponding the magic energy that is left, the number of creatures on the field and the number of Adepts that are left, life energy, shooting speed and shooting strength of the own citadel are defined. You should only set it off, when you have a clear advantage to untimely end the game. On both void fields of the static energy points conjuring is not possible. 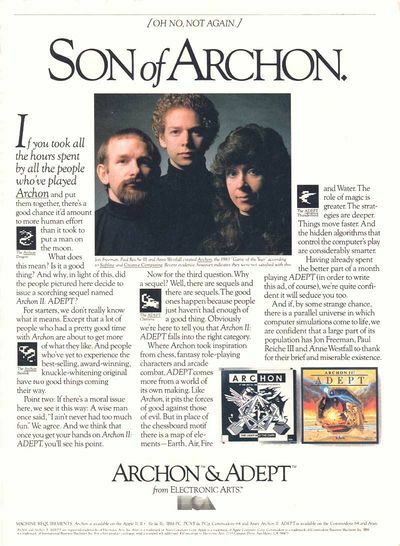 Robotron2084: "Archon 2 - Adept is a more than dignified successor - I even like it clearly more than Archon. The game is more dynamic, you have to consider the strenghts of the elemental beings, economise with the own energy and above all: the AI fights you tooth and nail and plays really strongly and aggressively. However, I can understand that some players feel uneasy about this "anything goes" and the game seems unseizable to them. But this is just the difference and the strength of Adept in comparison to the gridlocked structure of its forerunner with its rather limited possibilities It seems a logical consequence that Adept co-developer Paul Reiche further extended this aspect a year later with Mail Order Monsters. 9 out of 10 points! This page was last modified on 5 February 2019, at 17:47.